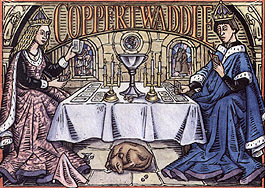 Coppertwaddle is a medieval game of skill and strategy based on a unique deck of fifty-five cards. The game's appeal comes from the delightful woodcut illustrations on the cards and the use of medieval naming conventions. Two players compete to build two Ranks of Threlms(one of nobles and one of peasants). The first player to complete two Ranks of Threlms wins.